An independent, Midwest-based fabrication shop wanted to increase the capacity of their punch press operations. 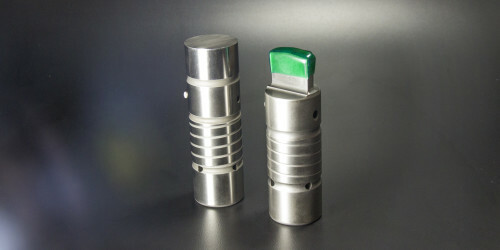 They turned to Mate Precision Tooling to help find ways to improve their operations by reducing material and labor costs, while improving their output. The shop increased their available monthly labor hours by replacing a repetitive process with a tool that improved the workflow. After visiting the production floor and observing operations, Mate’s Sales Engineer recommended using a quad-radius tool in the auto-index station of the punch press to improve the nibbling process. The auto-index station rotates a punch and die to any designated angle dictated by the machine program. A quad-radius tool uses an arc to create a much larger circle with smoother edges. It also produces larger holes with far fewer hits than using a round nibbling punch. In effect, the quad radius tool puts 8, 12, 16 and 20-inch diameter punches into a single 2-inch station, increasing efficiency and greatly reducing the common problems associated with nibbling. Before consulting with Mate, the customer spent 90 seconds to nibble each part. Using a quad-radius tool saved 30 seconds per part. With the customer producing 2,000 parts per month, they saved 1,000 minutes (30 seconds x 2,000 / 60) per month, or 16.7 hours. At a burdened labor rate of $45 per hour, this equates to a savings of $750 per month or $9,000 annually. Perhaps more importantly, the quad-radius tool added 16.7 hours of production capacity per month for the company, or 200 additional billable shop hours annually. At a billable shop time of $125 per hour, our customer now has the potential to increasing billings by $25,000 annually. Contact us today to discover how Mate can help you find efficiencies and cost savings for your fabrication operations.